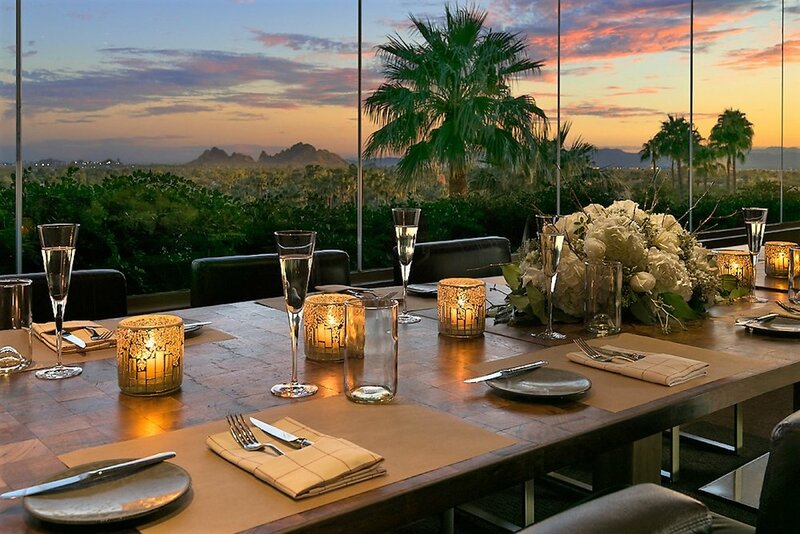 (PRESS RELEASE) - The award-winning fine dining destination, J&G Steakhouse at The Phoenician, will take a 'Summer Break' as it prepares for its 10-year anniversary later this fall. On Sunday, June 3, 2018, J&G will begin work on a stunning, stylish refresh, including new flooring and furnishings, updated décor and color schemes, enhanced seating on the outdoor dining patio and a modernized kitchen. The restaurant is scheduled to debut its new design, along with fresh new seasonal food and drink menus highlighting the flavors of fall, in early September 2018. Taking cues from the dramatic Arizona landscape, J&G's updated color palette will combine the deep reds and neutral creams and grays of its Sonoran Desert surroundings, complementing the rich red onyx stone found throughout the restaurant. Crafted by Parker Torres Design, the internationally-renowned design company behind The Phoenician's luxurious new lobby, lounge, spa and pool areas, J&G's new wall treatments, light fixtures and furniture will also showcase polished metal accents, including a show-stopping glass wall with gold sculpture treatment added to the Mountain View private dining room. Plus, just beyond J&G's signature floor-to-ceiling window wall, the scenic outdoor dining patio will offer refinished fire pits and the addition of ceiling fans to transform this space into a year-round alfresco dining destination. Prior to the refresh, guests are invited to visit J&G Steakhouse for a special three-course Summer Break menu handcrafted by Chef de Cuisine, Jacques Qualin, and served nightly from Memorial Day on Monday, May 28 through Saturday, June 2, 2018. Alongside J&G Steakhouse, The Phoenician will also be updating Relish Burger Bistro with an expanded bar, an enhanced patio with new rollaway garage-style doors to create a seamless indoor-outdoor experience, an upscale menu of bar food favorites (including gourmet burgers), as well as a new name: The Phoenician Tavern. Work is slated to begin on July 9, 2018 and finish in late Q1 2019. A comprehensive renovation of The Phoenician Golf Clubhouse, including an updated pro shop, locker rooms and 19th Hole snack shop, along with a refreshed exterior-has also been added to the three-year-plus transformation of the iconic AAA Five Diamond resort. Clubhouse refurbishments get under way on June 1, 2018, and are expected to be completed by late October 2018. J&G Steakhouse at The Phoenician is located at 6000 E. Camelback Rd. in Scottsdale, AZ 85251. 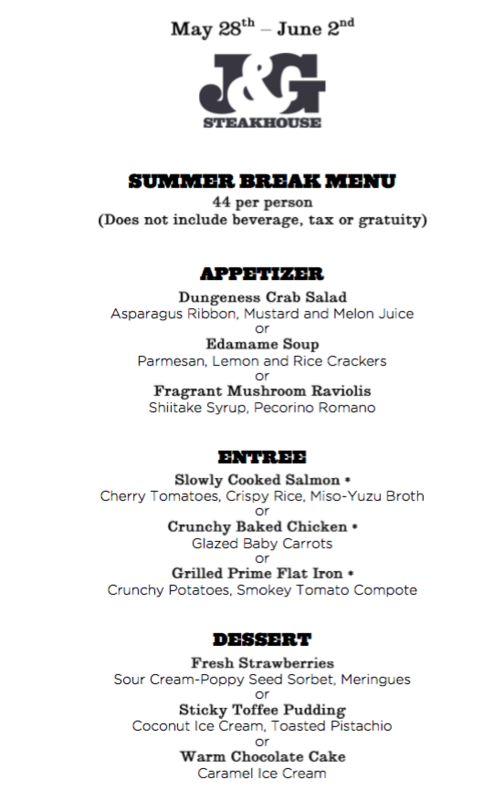 For reservations call 480-214-8000 or visit www.jgsteakhousescottsdale.com.